Kumdo is a Korean Martial Art that translates to "the way of the sword". Kumdo, closely related to the Japanese form called Kendo, is a Korean Marital Art that teaches one to use a sword. Beginning students will learn Kum Do using a bamboo sword (juk do) and a wooden sword (mokum). 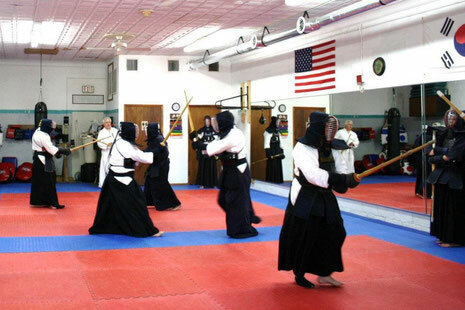 Once a student heas earned their Black Belt, they will begin to use a real sword (jingum). Students will also learn that there is more to Kum Do than just using a sword. They will learn that to be successful, one must combine the three elements. Inner strength or spirit, called "ki"
The use of one's minde called "kum"
And the use of one's body, called "chae"
By combining all three elements, a student will be displaying what is called "ki"kum-chae". Finally, Kum Do is a martial art that does not rely on size or strength. In other martial arts, if one is fit and strong, they will often beat an opponent. During a fight, a person can take a hit or kick and come back to win the battle. In Kum Do, a person would not get a second chance if struck with a sword. So in Kum Do, spirit, attitude, and inner strength will often defeat an opponent who is bigger and stronger.